Bugs… Nobody wants them inside their house, but that’s what was flying through the big rips in our previous back-door screen. The old screen had draped the doorway, split in the middle and weighted at the bottom. It worked fine for a while, but an impatient cocker-spaniel and a headstrong one-year-old eventually tore it to shreds while trying to fight their way through it. A new screen that neatly and easily tucked out of the way seemed like a good choice for a replacement, and ODL just happened to have such a new design on the market. The product was marketed as “easy to install,” but one person’s “easy” project is another person’s confusing pile of parts, so I decided to dive into the project and give you my version of the installation procedure, which I think will elucidate the instructions that came with the kit. 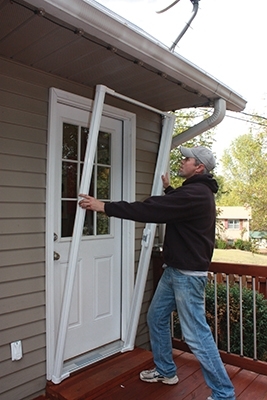 The ODL Brisa Retractable Screen Door comes in one of three kits: Single Door, Double Door, and Sliding Door; as well as three door sizes (for heights of 6’6″, 6’8″ and 8’0″). 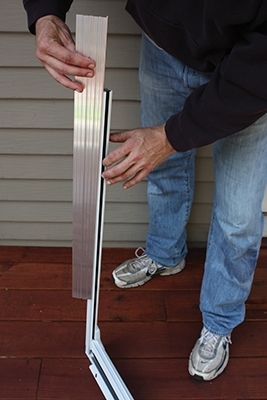 This article details installation of a single standard 6’8″ kit, which covers 32- to 36-in. openings. The screen frame will expand outward against the inside face of the casing/brick mould, so measure the distance between the two interior edges to determine the size of your opening. Refer to the screen instructions regarding the sill of your doorway. If your door has a short sill (meaning its front edge ends before the brick mould/casing terminates), then you won’t have adequate lower support for the screen frame to sit on. In this case you’ll need to add blocking beneath it or make some other accommodation to the sill before installing the screen frame. The screen kit contains five primary components: The left-and right-hand housing units, the upper and lower tracks that connect them, plus a sill plate assembly. You can assemble all the parts on the ground to form the screen frame, but leave the connections loose so the tracks can slide in and out of the housing. 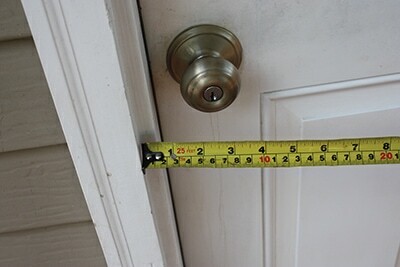 This allows you to adjust the frame’s width once inside the door frame, so you can fasten flush to the casing. 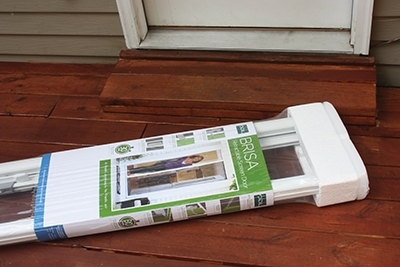 When assembling, be sure to orient the screen housing on the hinge side of the door. Insert the notched ends of the tracks into one of the housing units. Arrows marked on the connection tabs of the housing show where to align the channels of the tracks. Make sure the connections are aligned so the screen can thread through the channel. Before adding the second housing unit onto the tracks, slide the bead of the sill-plate assembly into the groove of the bottom track. 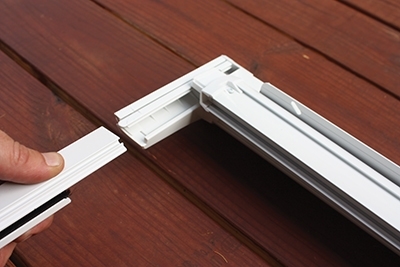 Once in place, slip the two plastic sill extenders onto the sill plate. Finish assembly by inserting the flat ends of the tracks into the other decorative housing unit, completing the rectangular frame. Slide the frame together and tilt it into place. Extend the housings to the left and right so they slide against the inside of the casing. The housing has slotted screw holes, and the kit includes fasteners. Fire screws through each hole into the casing at each frame corner. 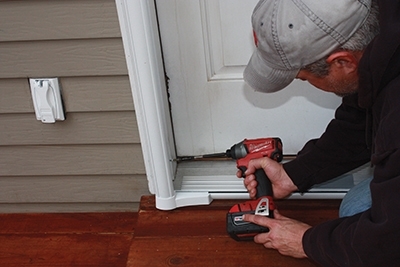 Pin down the sill plate with sill screws, keeping the screws 4 inches from each end. 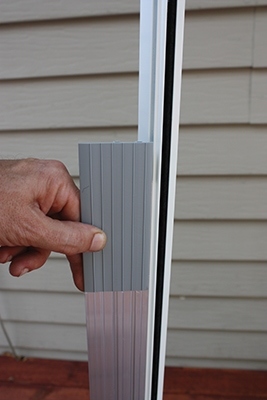 The sill extenders slide to each end of the frame sill to ensure all gaps are covered on both sides at the floor level. You can cut the plastic extenders for a tailored fit, but I just slid them beneath the door casing and tucked them out of the way. 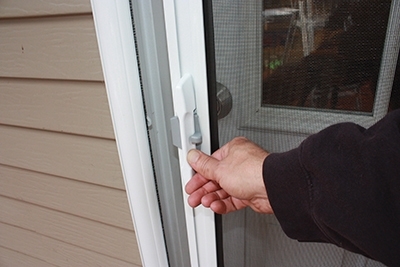 The new screen slides easily along the track and simply hooks onto the door latch. Simply lift the lever to open. 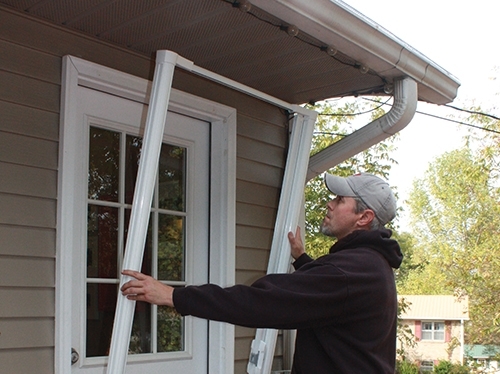 The retractable screen is easy to install and it works well. If you’ve got thirty minutes and a bug-intrusion problem, then you can add one yourself. For more information, visit www.odl.com.